Canadian regulators have released a new draft revised guidance that it says will clarify a previous guidance on look-alike, sound-alike (LASA) names that seeks to protect consumers from drug mix-ups. In a statement, Health Canada said that the 2006 Guidance for Industry - Drug Name Review: LASA Health Product Names was intended to solve a problem: "Health product names often look and sound alike." This can become a problem for consumers if they are simultaneously prescribed two medicines with proprietary names that sound or look alike, as they could take the medicines at the improper time or at the improper frequency. But even clinicians and pharmacists can potentially mix up drugs as well, dispensing the wrong product to an unwitting patient. Regulators said they were aware of studies that put the error rate at 0.13%, or 672,000 prescriptions annually in the US. To confirm this, sponsors of applications were supposed to submit evidence regarding the name of their product, its pronunciation, and whether it might be confused with another marketed product. That's the theory, anyway. Regulators said that when they set out to re-evaluate the program recently, their internal analysis of submissions "revealed significant variation in the amount, type and quality of the evidence submitted by market authorization holders." 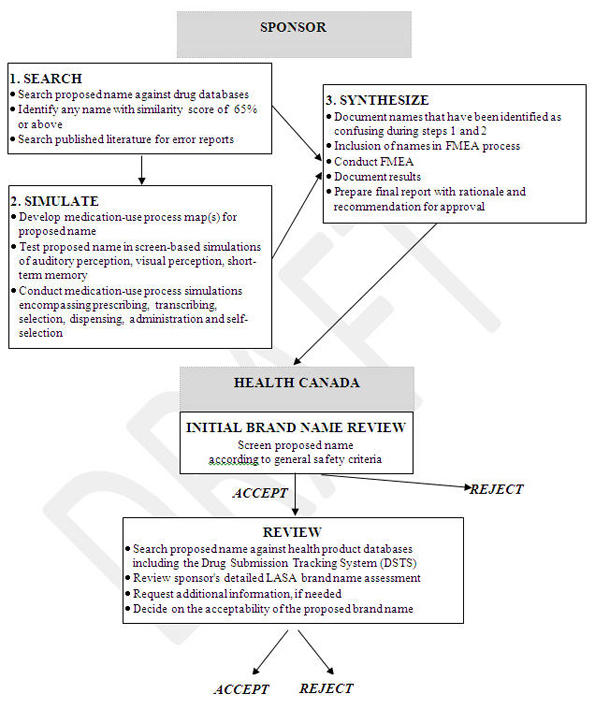 "This analysis, along with requests from industry for greater direction and continuing public concern about medication incidents due to LASA names, suggested that there was an opportunity to improve public health by revising the 2006 guidance on LASA brand name assessment" Health Canada wrote. On 19 February 2013, Health Canada released its newly revised draft guidance on LASA health product names, which it said is more detailed in what it asks for from sponsors. Importantly, sponsors that do not conduct a LASA brand name assessment may not be granted product approval (by way of a notice of compliance) by regulators. Health Canada said it "reserves the right to request information or material" at any time, and to reject a name if it believes it is "likely to cause confusion with other health products, or is misleading with respect to therapeutic effectiveness, composition or the safety of the product." The guidance also notes that regulators will only permit a sponsor to submit a single name at a time for review. Should that name not be acceptable, a second name must be submitted, with the process repeating as necessary. But much of the guidance focuses on the actual process for naming the drug product, and the objective data necessary to support an application for a particular name. Sponsors should run a search of their proposed name in a drug database (based on the ALINE algorithm and a Phonetic Orthographic Computer Analysis, or POCA, score) and identify any name that achieves a "similarity score of 65% or above." Regulators said software to run this analysis is commercially available from numerous vendors, and should be used. Additionally, "It is important to note that the list of five phonetic and five orthographic nearest neighbors are to be submitted in addition to, not in place of, the list of all names with ALINE scores equaling or exceeding 65%," Health Canada wrote. This is to ensure that names that could sound the same or look similar but don't necessarily register as "similar" are still identified. Health Canada referred to these names as "nearest neighbor" names. 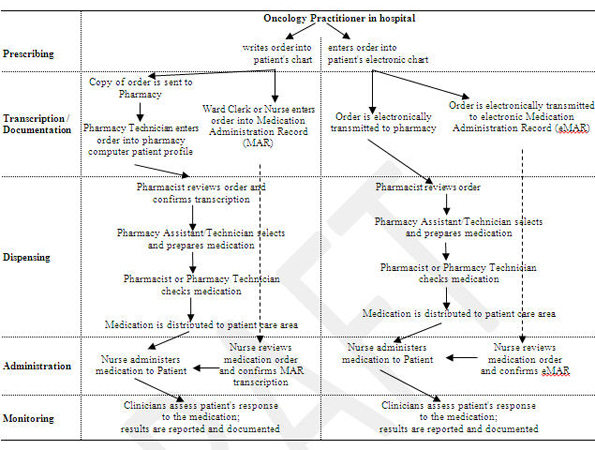 After running the similarity score and the phonetic and orthographic analyses, companies will be required to simulate the use of the product through screen-based and medication-use process simulations, which are intended to see if a product is prescribed, transcribed, dispensed, administered or self-selected properly. Companies should take note of the failures that occur during this testing, and should outline the entire process through a process map. These simulations should be paired with a failure mode and effects analysis to determine if the proposed name has any "significant failure modes," and, if it does, determine whether they are enough to derail regulatory approval. That analysis should answer four main questions, regulators said: Are there any drugs that could be confused with the proposed brand name, what are the effects of a patient not receiving the intended drug, what are the effects of receiving the other drug product, and what happens if patients receive a mixed batch of the same drugs? Sponsors must be prepared to answer all of these questions as well. Non-branded (aka generic) drugs are not covered by this guidance unless they seek a brand name. A visual explanation of the process can be found here. The revised draft guidance may be found here.